The man in the exquisite black and white uniform approached me with a smile on his face. Handing over my menu, I ordered an orange juice, a coffee, and a hearty breakfast. Leaning back in my chair, I admired my surroundings. Indeed, the scene was one just out of a movie. The sun shone brightly through the trees onto the flowers surrounding the outdoor patio of the Literaturhaus – a famous literature house in Berlin, which incorporates a unique book store and a fancy restaurant. All around me were distinguished-looking Germans, laughing and chattering away in the Berlin summer heat. I didn’t look too out of place myself in my summer sundress, designer sunglasses, blonde hair coiffed, and a Spanish-language book in hand by Mario Vargas Llosa. The occasion for such a celebration? Simply put, I had a day off work. Actually, my primary purpose for this adventure into “West Berlin” (even though the city is no longer divided, there is a noticeable difference and I spent far more time in the East) was to go to the house next to the Literaturhaus, which hosts the Käthe Kollwitz Museum. 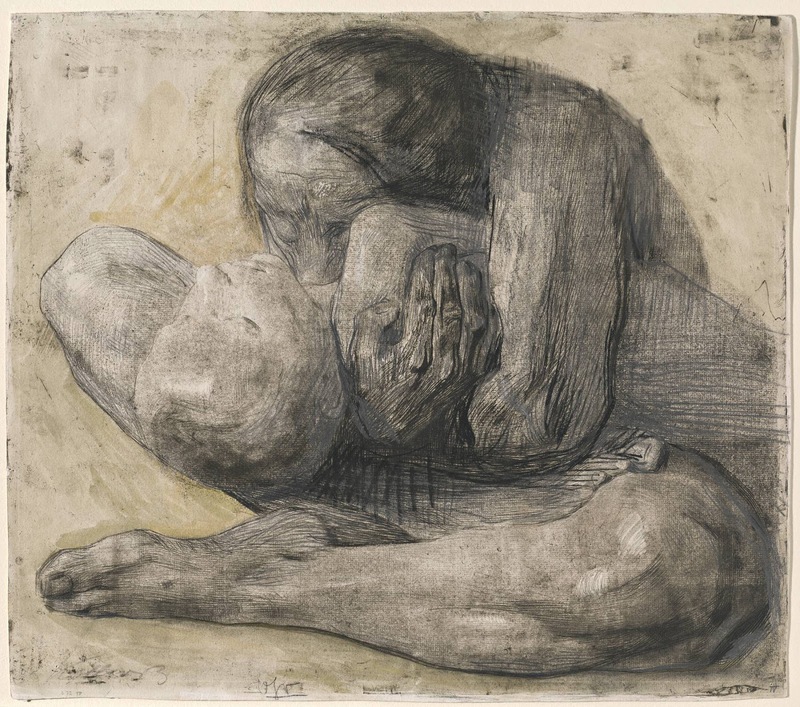 Raised by a mother who is an artist, I was exposed to many prolific and obscure artists early in my life, but my knowledge of Käthe Kollwitz came much later. However, as soon as I saw her powerful works, I was instantly moved and she became my favorite artist of all. I recently read a biography about her written by the late academic Klemens von Klemperer. 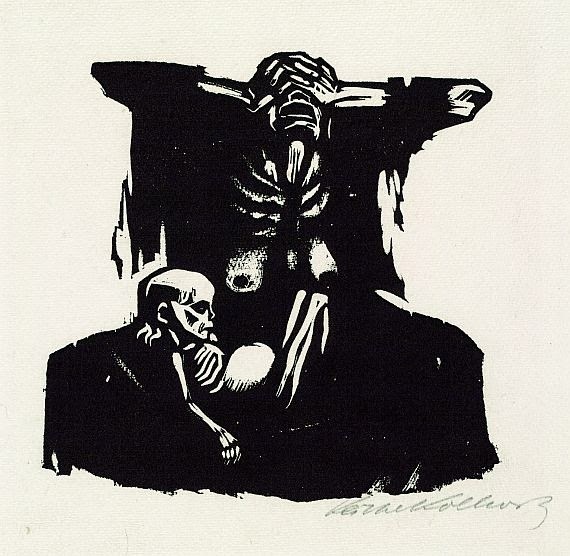 In it, he describes that Kollwitz was deeply affected by the suffering of the German people during the First World War. After losing one of her own sons during this conflict, she focused her work on social subjects: the pain of motherhood, hunger, death, and strife – in a dark, bold style. My favorite artist might come as a surprise to some of my friends. Normally, I am up for the most modern art I can find/experience. (I mean, I am one of those types of people who went to see an “opera” of jibber jabber in a warehouse – sitting on a beat-up crate as the singer started spray painting the white walls blue.) However, the quality that most attracts me to any piece of art is its social statement, not its aestheticism. Art is another means by which to communicate – and I am much more interested in the content of communication, rather than what is sounds/looks like. 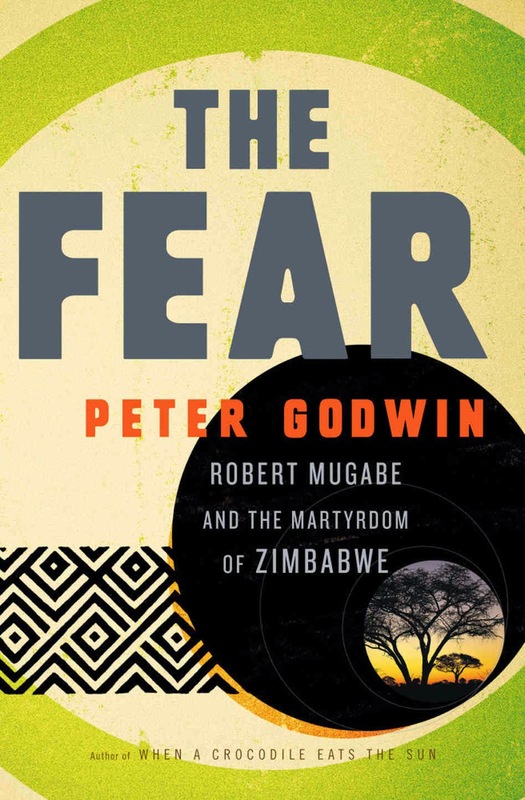 As I was looking up Godwin’s website as I wrote my first book review on Zimbabwe, I found myself absolutely entranced by the book trailer for his latest book, “The Fear: Robert Mugabe and the Martyrdom of Zimbabwe.” I was fascinated to see how a book, an art exhibit, and marketing could combine to communicate a social message so powerfully. (If you don’t want to watch this video, here is an overview of what you would see: As more and more bookstore-goers listen to clips of the book, exposing the human rights violations and the authoritarianism of Mugabe’s government, the displayed bust of Robert Mugabe starts to crumble into pieces. This is supposed to represent the fact that Mugabe’s power could be broken through exposure to the truth and the West’s subsequent action.) I knew then and there that I had to read it. In 2008 after botched elections, Mugabe’s regime began to fall apart at its seams, after which he accepted an unprecedented power-sharing in the government; allowing other political parties to take part. However, in the midst of this so-called power-sharing, he re-energized and struck back, eventually disregarding this new arrangement and consolidating his dictatorial power once again. This book shows how this happened – bit by bit; step by step. I highly recommend it to whomever is interested in learning more about this tragic case of modern Zimbabwe. The chapters are short and Godwin writes in a very accessible way; making this new information and African names (still unfamiliar to Western ears) understandable and comfortable. One of the aspects which particularly caught my attention is how many times the word “genocide” was thrown around. Indeed, genocide, or rather, acts of genocide occur far too frequently on the African continent. That being said, I had never heard of “genocide” in context to Mugabe’s regime before. Godwin’s explanations gave me a new appreciation for how closely politics and tribe/ethnicity are intertwined. Subsequently, suppression of a political movement can easily turn into an act of genocide - as quickly as wildfire can spread in a forest. Godwin outlines abuse after abuse of the regime of Robert Mugabe. He notes that, at the time of publishing, Mugabe’s approval rating hovered at only about 12%, according to a Freedom House report. However, he notes that the real reason that the Mugabe regime has not yet collapsed is due to outside forces: “It is about twelve miles to Mvurwi hospital, and on the way we pass a large World Food Program depot. Bags, plump with grain, are stacked up high. This is how Zimbabwe eats. The same Western powers that Mugabe routinely demonizes in his banal biopsy of blame are the principal donors of food to his people. These towers of grain bags are all that stands between Zimbabwe and full-scale famine.” (page 144) Godwin ends his book with a call to action that is both powerful and poignant, sharing the apathy of the West (also including Zimbabwe’s neighbor of South Africa), as well as the pain of the Zimbabwean people - insinuating that they are alone in this struggle.